It used to be that organizations would set up multiple wired infrastructure networks to handle phone, data, video, audio, control, security, KVM, etc. Now, multiple options are emerging that can allow one or two networks to do all the stuff of multiple networks in the past. That is creating lots of new opportunities for hardware, software and installation providers and offering real benefits to end users. Multiple networks are not uncommon in broadcast, government, control centers and corporate environments. Each can require its own hardware, software and dedicated technicians to maintain, upgrade and operate the network. Audio guys don’t talk IT and may not talk video, so it becomes an expensive proposition. In addition to convergence of the networks, the demands on the networks is increasing as 4K content becomes more prevalent and video use skyrockets. As a result, new solutions are emerging that bundle together certain convergence features that meet the needs of targeted markets or applications. HDBaseT is a perfect example of the trend we are talking about. The 2.0 standard uses an Ethernet infrastructure to offer the option of delivering five different elements: audio and video, power, USB, control or Ethernet. How you use it depends on your needs. 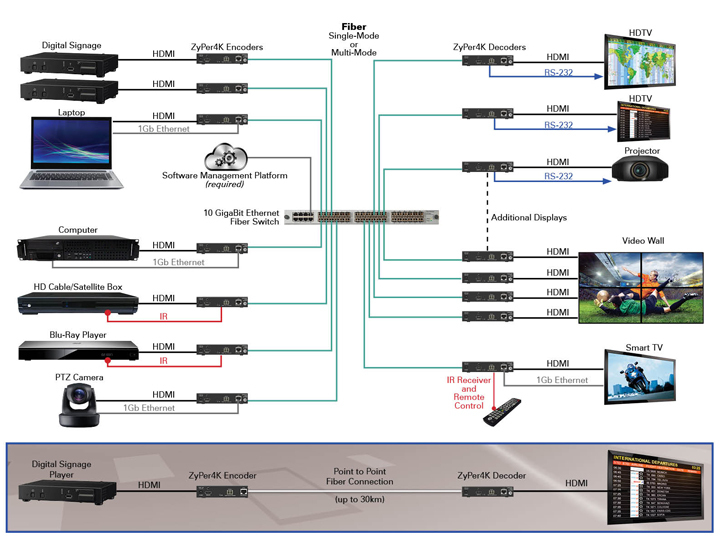 The HDBaseT specification supports an asynchronous channel with up to 7.2 Gbps capacity. That means you can deliver 4K resolution video at 60 fps with 4:2:0 chroma sampling, with other capabilities running in the auxiliary channel. Although HDBaseT can transmit for up to 328ft, the distance is dependent on the quality of cable, environmental noise, and video definition. But you may also find HDBaseT is also really good for delivering 1080p class video plus power to a monitor over a single wire with control and Ethernet. This makes sense for a low power device like a monitor, but maybe not for a more power hungry device like a projector (HDBaseT can deliver up to 100W of power over a LAN cable). HDBaseT does require that hardware in the network support the HDBaseT protocols to implement a solution. Alternatively, a company like ZeeVee says they can use standard off the shelf networking gear to deliver audio and video. From its rich history in the in-premise distribution of multiple HD sources to unlimited numbers of televisions/displays over coax using RF encoding/modulation, ZeeVee has been evolving to address the market need for 4K video distribution. Its new ZyPer4K enables users to shift from conventional, proprietary switching solutions to industry standard, off-the-shelf 10Gb Ethernet technology. The high speed and high bandwidth associated with 10Gb Ethernet infrastructure provides ultra-low latency distribution over very long distances, and because of its true IT DNA, ZyPer4K will be one of the first companies truly supporting a single network architecture for both IT and AV. For those longer distance runs or for very low latency applications, Thinklogical has come up with a new solution called TLX. This is based upon an uncompressed 10Gbps network fabric that allows end users to use either CATx cable or fiber optic cable from the same card. For example, if you are transporting 4K or 2K content over relatively short distances you can use one or two CATx cables. Need to go further with low latency? Then use the fiber options (single or multi-mode). 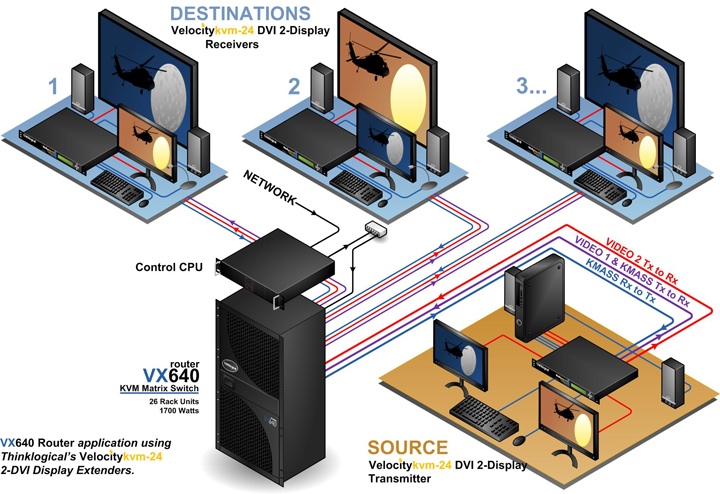 In addition to AV transport, such networks are also able to integrate KVM (keyboard, video and mouse) capabilities to allow remote users to run applications on a central server with no lag. But if you want a really big pipe MHL released its latest specification, superMHL. While the distances are shorter, it can run at up to 36 Gbps over a single cable to support 8K, 5K and 4K up to 3 meters and is perfect for in-room applications. Features include High-Dynamic Range (HDR), a wider color gamut, Deep Color, immersive audio (Dolby Atmos, DTS:X and more). DSC compression is also supported to send more data over fewer lanes to deliver higher resolutions. Consumers will be able to connect their mobile devices to set-top boxes (STBs), Blu-ray Disc players, AVRs, streaming media sticks and other source devices to TVs and monitors. MHL is connector agnostic so it supports the popular and existing connectors. MHL has also embraced the trend towards connector reversibility with its support of USB Type-C and the release of its own superMHL connector that can carry concurrent audio, video, data and power in a slim, consumer-friendly design. Lattice Semiconductor’s solutions continue to innovate in the areas of HDMI and MHL, and with the recently announced superMHL and USB Type-C chipsets, the next evolution in resolution is here! We know the demand for more bandwidth will continue, so how can wired infrastructures adapt to these demands? We will learn a lot more at Display Summit.